Even when I was a child it was suggested that I was a different kind of thinker. I always feel a kind of pride in this as for me thinking outside the box has so often been associated with the ability to see things from a different perspective or to see an unexpected way to approach a challenge. In this respect, Thinking outside the box is a metaphor for creativity and problem-solving skill. The metaphor of the box came to have additional significance for me after H was diagnosed with autism, and I started down the path to immerse myself in autism research, complete my MEd, and become a Special Education Teacher. I now work to support teachers (and others) in expanding and deepening their appreciation of the ways in which some of the core challenges of autism affect student learning and cognitive, social, and emotional development. Educators require this information so they can more effectively create and apply strategies to meet the needs of this diverse group. Essentially then, the extension of the metaphor here is that neurotypical thinking could be viewed as generally within the box, or within the range of widely held social norms, and those with social-cognitive challenges could be considered to be outside the box. Through my interactions with my son I am learning immeasurable lessons about the importance of the mentor/apprentice relationship, the power of cognitive behaviour interventions, sensitivity to the pace and space of others, and I am daily offered the privilege of glimpsing the world from his perspective. The skills that supporting my son has helped me to hone are now being used to work with students, parents, teachers and others. 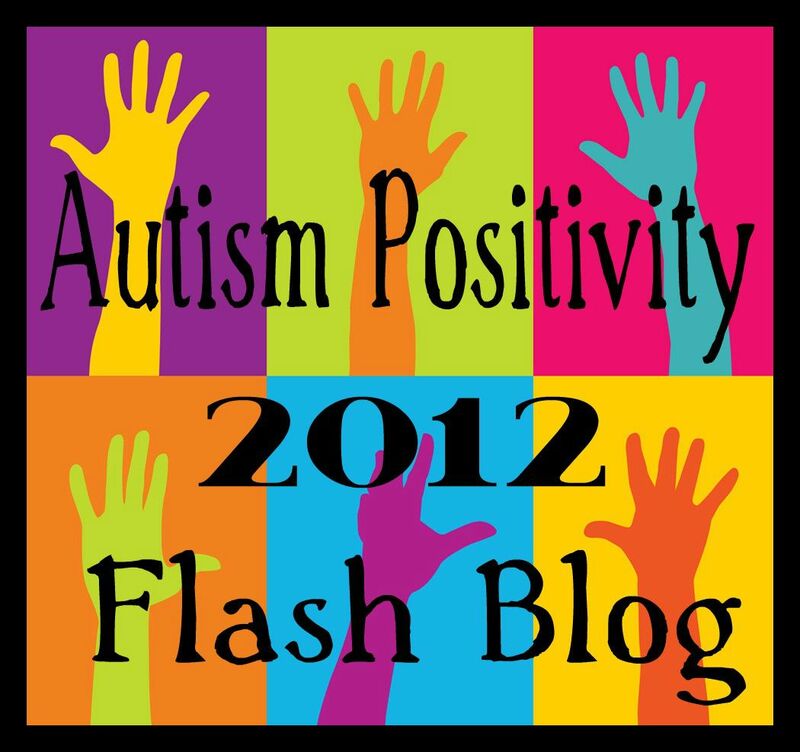 In fact, when I am working with groups of teachers, it is through stories about my experiences with my son that others are coming to understand and see the meaning behind the core challenges of autism such as understanding the perspective of others and reading non-verbal social cues, etc. I thought that I inhabited the realm outside the box – as I am a divergent, lateral, sometimes irreverent, and somewhat unconventional thinker – but I may have been wrong! Now I am considering a different aspect of the box: one I had not contemplated. I had thought about the inside and the outside, the lid, and the aspects of it being open or closed and its potential limitations, but I had never contemplated the edge. Now I am thinking that maybe the box metaphor has a new relevancy for me – when I consider the edge. Perhaps, this is what those who work closely with children on the autism spectrum (parents, teachers, caregivers) have to offer: we can see both inside and outside the box. 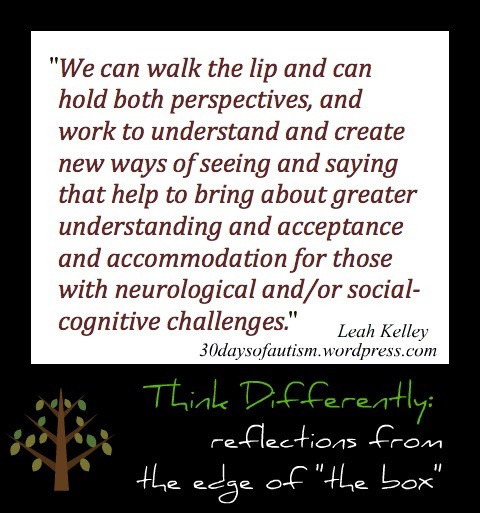 We can walk the lip and can hold both perspectives, and work to understand and create new ways of seeing and saying that help to bring about greater understanding and acceptance and accommodation for those with neurological and/or social-cognitive challenges. So I guess this is a good place to be: neither outside nor within the metaphorical box. Instead, I seem to be on the lip, contemplating the edge, working to maintain balance, and considering ways to share this perspective. 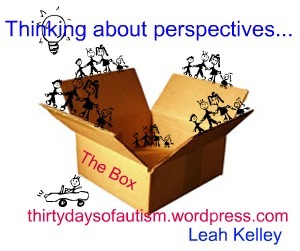 This entry was posted in ASD, Aspergers, Autism, promote social understanding, Social cognition, Social Thinking, Special Education, Teacher, ToM (Theory of Mind), typical and tagged acceptance, Autism, balance, creativity, Metaphor of the box, Neurotypical, outside the box, pace, parents, Perspectives, problem-solving, Special Education, teacher, thinking outside the box. Bookmark the permalink. I am standing along side you. It is this perspective that can create greater understanding. I like the balance you are manifesting, using tools you’ve learned and instincts to create that edge wherein lies understanding – an opening of our collective eyes to change and growth – to new ideas, perspectives, and acceptance. Thank you.